Some people say that once you’ve gone to India, you will leave either passionately loving it, or hating it with all your heart. I’ve been to India once, and I can say I had felt both. 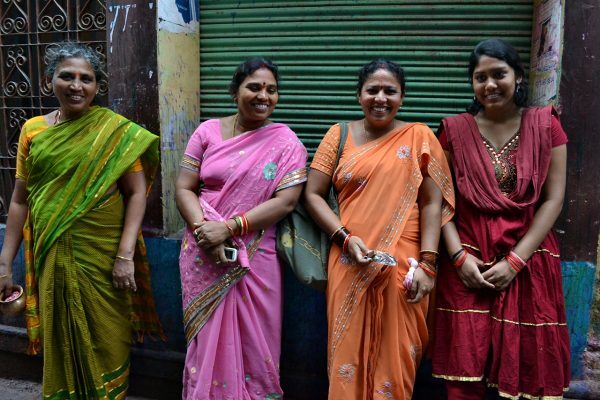 Back in 2013 when I went backpacking solo in India for 3 weeks, I experienced the nightmare of every solo female traveler: I got assaulted by a group of men on the streets of Varanasi. India calls it Eve teasing, a term that doesn’t quite capture the seriousness of a woman’s fear and helplessness as she is groped publicly and repeatedly by men who feel entitled to her body. I wrote about my experience, and messages of support from Indian nationals (both men and women) flooded my inbox. Yes, Eve teasing is prevalent, they said. And yes, they are sorry. Go to the south next time, others advised. The men there are more respectful, said others. At that time, going back to India was the last thing I wanted to do. There are so many countries to visit, so little time. But I had decided that the next time I visit India, I will follow my Indian friends’ advice: go to the Southern states and find places to travel alone in India that are safe for solo female travelers. 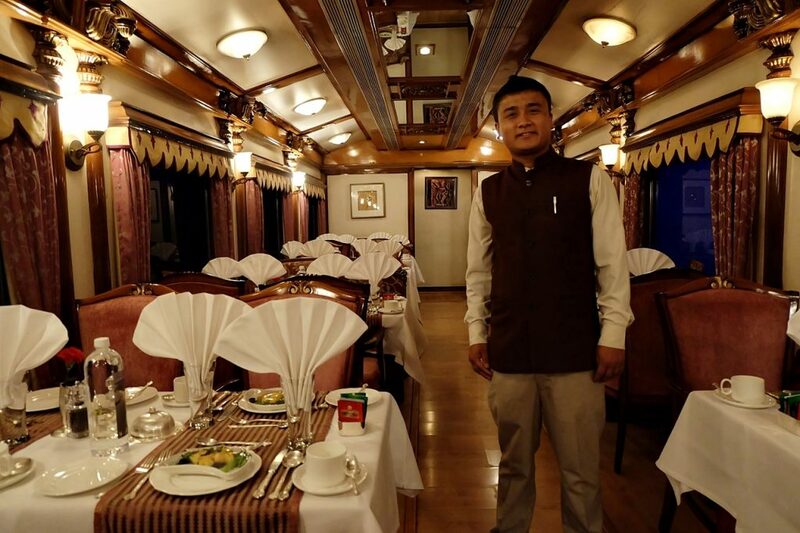 I was very glad, then, to have been chosen as one of the bloggers to explore India on a luxury train. The campaign, an initiative of Incredible India under the Ministry of Tourism, is called The Great Indian Blog Train. It takes 60 bloggers in four luxury trains throughout the country, giving the bloggers exquisite (though brief) glimpses of India’s most scenic destinations. 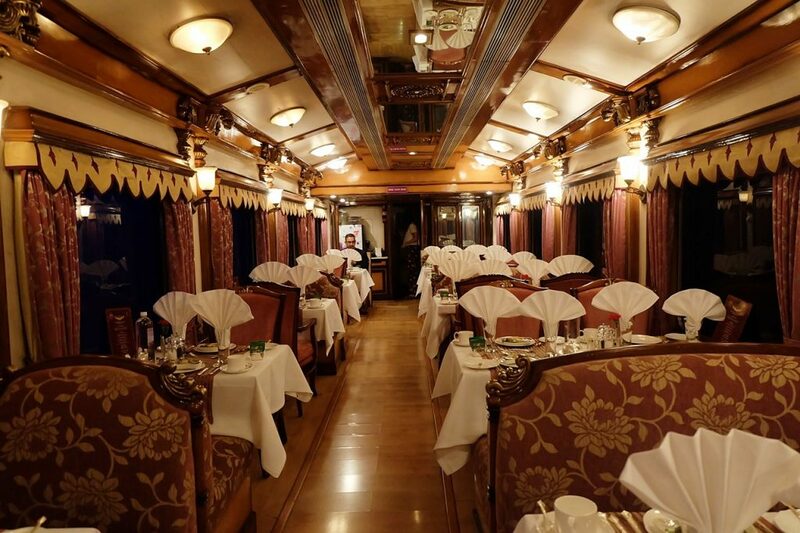 I asked to go with the Golden Chariot — the other luxury trains are The Maharajas’ Express, Palace on Wheels, and Deccan Odyssey — because its itinerary will take me to the south of India. It was time to go back. The bar on the Golden Chariot. 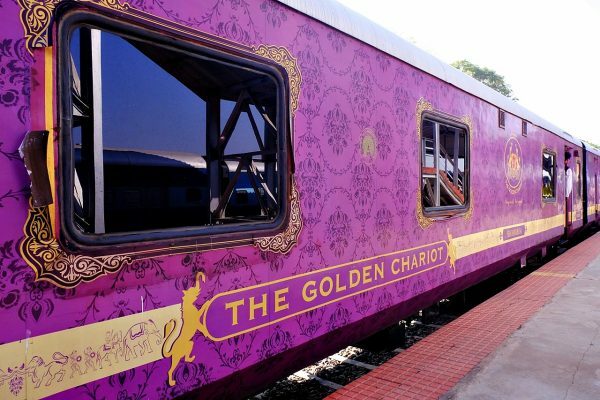 While I will write a separate review of my experience in the Golden Chariot, let me just give you a few facts about it. While India has four luxury trains, only one goes to the south. There are two itineraries: one goes from Bangalore and down to Goa (which is where I’m going, the “Pride of the South” tour), while the other (“Southern Splendor”) goes from Bangalore to Chennai and down to Kerala. 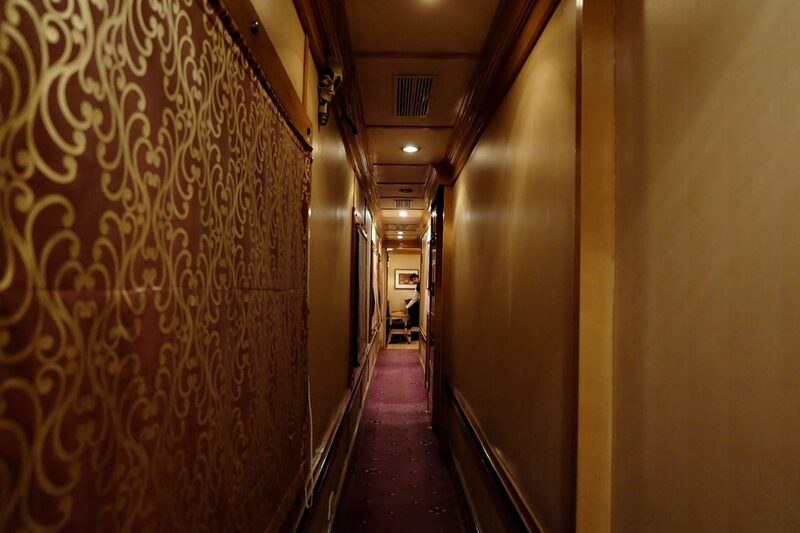 The Golden Chariot has a total of 44 cabins — air-conditioned rooms with a wardrobe, desk and chair, LCD TV, and washroom. 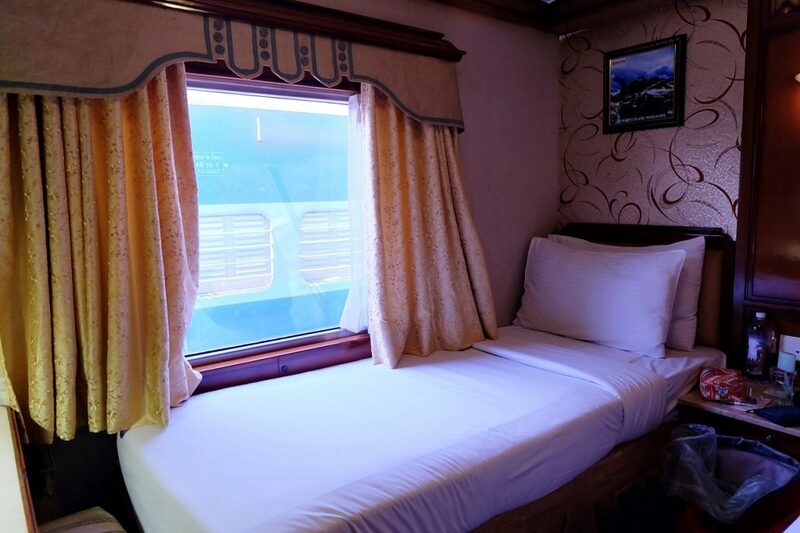 In essence, you will be on a train, but sleeping in a hotel room type of accommodation with 5-star hotel accessories. Having experienced general class and sleeper class trains in my previous trip to India, this will be very…well, luxurious…indeed for me! 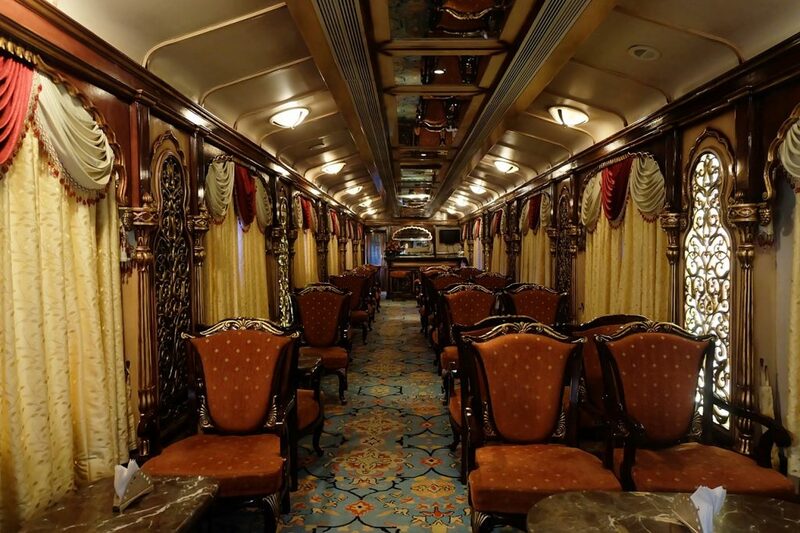 Meals are served in two dining cars that were modeled after the temples of Hampi and Halebid. There is a Cigar Bar Lounge, too, for those who smoke, that’d been modeled after Mysore Palace. Want to work out while the train is moving from one state to another? There’s a gym. And yes, they also provide massages. Read my review of the Golden Chariot. Of course, aside from the facilities of the Golden Chariot, what I am most excited of is the itinerary (from February 19 to 26). Here are the places we are going to cover. 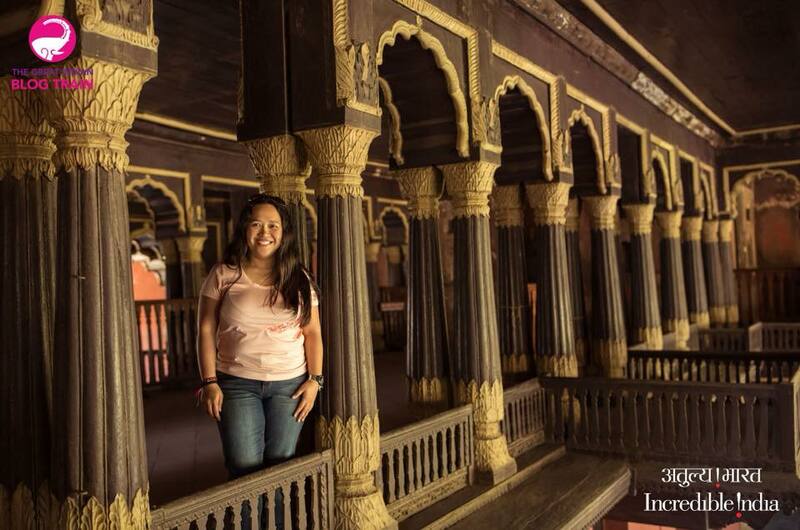 The Golden Chariot tours start and end in Bangalore. I had hoped to have a couple of extra days to go around the city before we leave, but I arrive the night before the train departs. Hopefully, I’ll have a couple of hours to go around on my own. Bengaluru is said to be India’s information technology capital, the so-called “Silicon Valley of India.” I’m sure all the modern buildings have charm, but I’m more interested in checking out some of its older and more interesting architecture. The Bangalore Palace, for example, looks gorgeous. Built in Tudor and Scottish Gothic style in 1862 (look at all those fortified towers, battlements, and turrets), it used to be owned by the Maharaja of Mysore. Fun fact: I’m a huge fan of Metallica, and they performed at the Palace grounds in 2011. It was attended by over 30,000 people; after them, no other musical events or concerts were held anymore at the venue. We won’t be spending much time in Mysore. 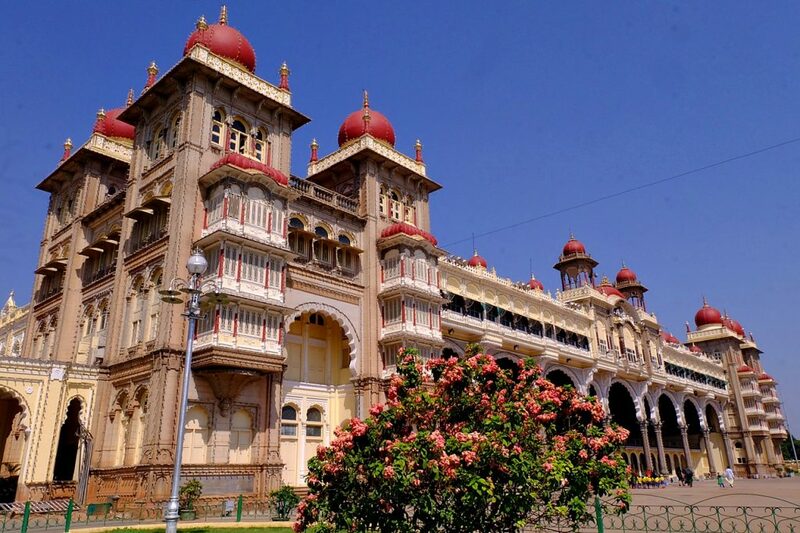 We will arrive there in the morning of Day 2 and visit Mysore Palace, the seat of the Kingdom of Mysore and just one of the seven palaces in the city. The exterior alone is fantastic; I hope we’ll have time to go inside! From the Palace, we will go straight to Kabini, where we will have a jungle safari and go on a boat ride on the river the next day. I’m very much looking forward to this trip, hoping I can see tigers and elephants. I’m not sure what we’ll do in Hospet, but we will go sightseeing in Hampi for sure. We will go to Hemakuta Hill, Virupaksha Temple, Queens Bath, the elephant stables, the royal enclosure, and Hazara Rama Temple. 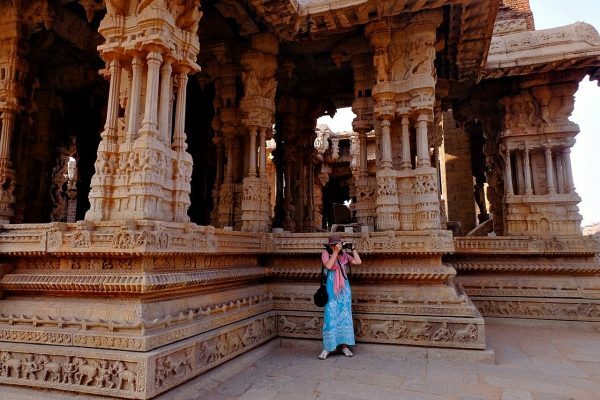 We will also visit the Vijaya Vittala temple complex and watch the sunset by the banks of the Tungabhadra River. The temples are bound to be interesting, but I think I’ll look forward to watching the sunset more. I’m a night person, and I would definitely travel for sunsets! I wrote about our Hampi experience here: The Ruins of Hampi, India: Visiting the Capital of a Once Mighty Empire. 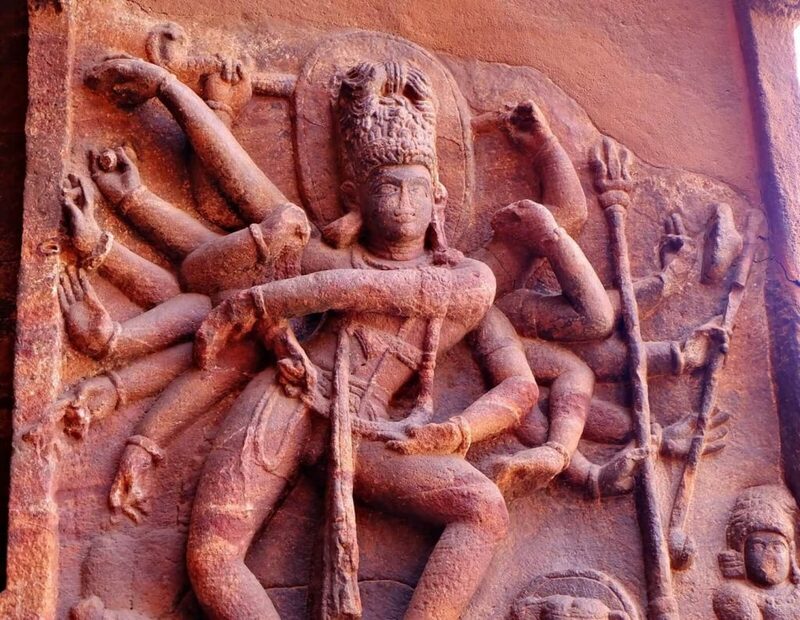 The Dancing Shiva with 18 arms in Badami Cave 1. We reach Badami on day 6, which will be a relatively relaxed day as we will only go to two UNESCO Heritage sites: the Badami and Pattadakal cave temple complexes. The Badami cave temples were carved out from sandstone hills in the 7th century. The highlight is supposed to be an 18-armed Lord Shiva in a dancing pose. The other temple complex, Pattadakal, was built in the 7th century and has 10 temples. Read my account of our Badami visit: Visiting the Badami Cave Temples in Karnataka, India. Our last full day will be spent in Goa, a former Portuguese capital popular with visitors for its white sand beaches, nightlife, and architecture. We will visit Old Goa for its churches which are a UNESCO World Heritage site. 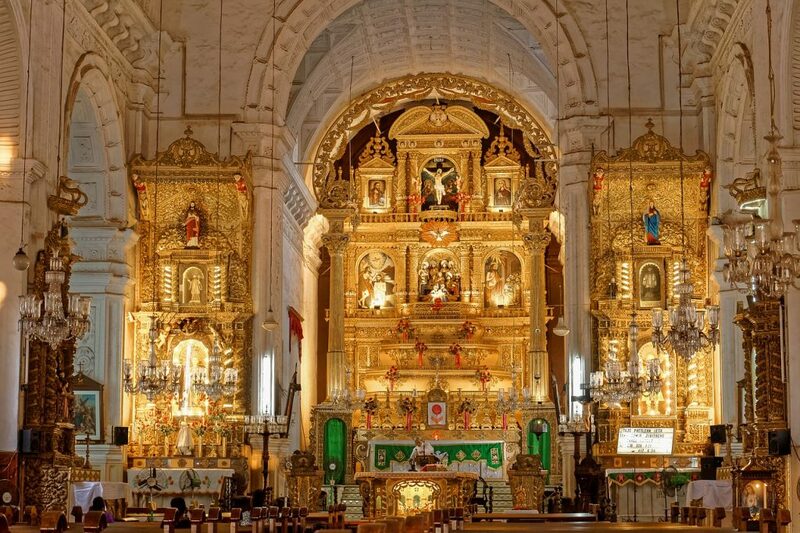 These include the Church of St. Francis of Assisi and the Basilica of Bom Jesus, which is important for Catholics because it has the relics of Saint Francis Xavier. And what’s a visit to Goa without checking out the beaches? We’ll only have three hours there, though, because we have to board the train again for Bangalore. A total of 8 days and 7 nights on a luxury train through Karnataka, a state in the southwest of India, does seem like a busy itinerary. You wake up, have breakfast, go on a tour, go back to the train, and then leave for your next destination. 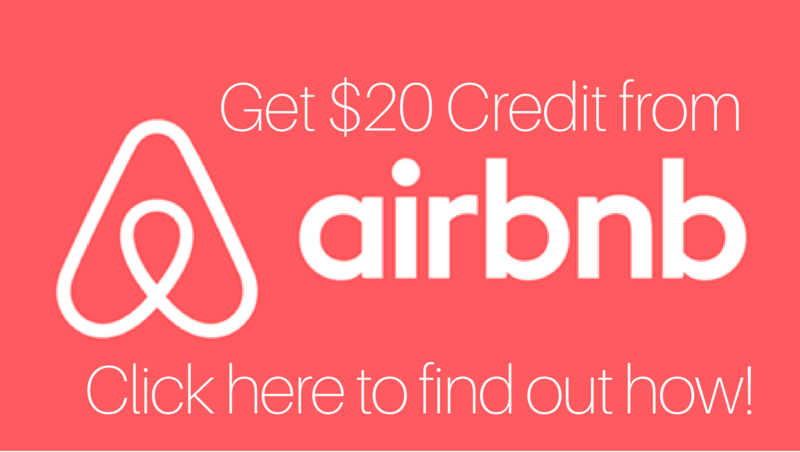 Its primary advantage, however, is you get to see a lot of places in a short amount of time. India is HUGE, and traveling from one state to another is indeed best done overnight on a train (which is what I did before in Northern India). You sleep and when you wake up, you’ll be in another state and well-rested enough to go exploring. My cabin — it has twin beds, a table and chair, and its own bathroom! This trip is not for all travelers, for sure. Backpackers and those on their gap year will probably not have the funds (starting at $3,000++ for the trip, including guided tours), and slow travelers like me will most likely find the trip rushed. 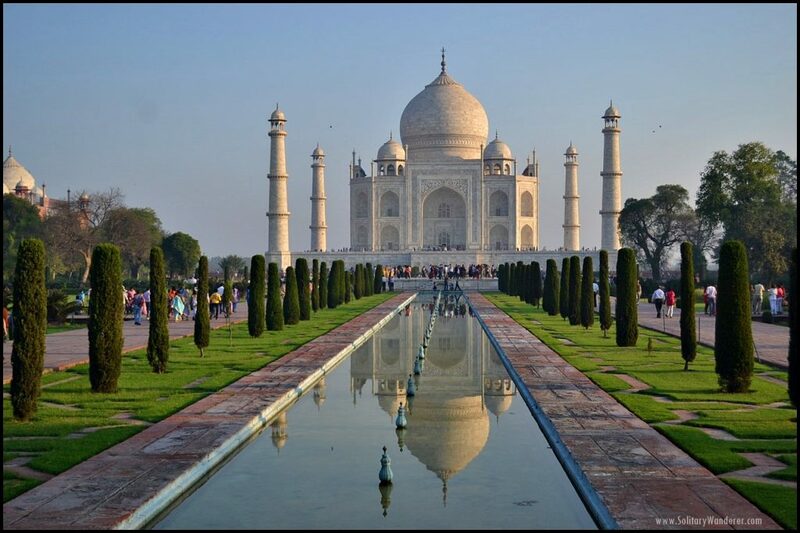 However, this is perfect for those who are either new to India and want to get a sampling of the country’s attractions without the hassles associated with travel organizing, or those who don’t have the luxury of time to travel independently. 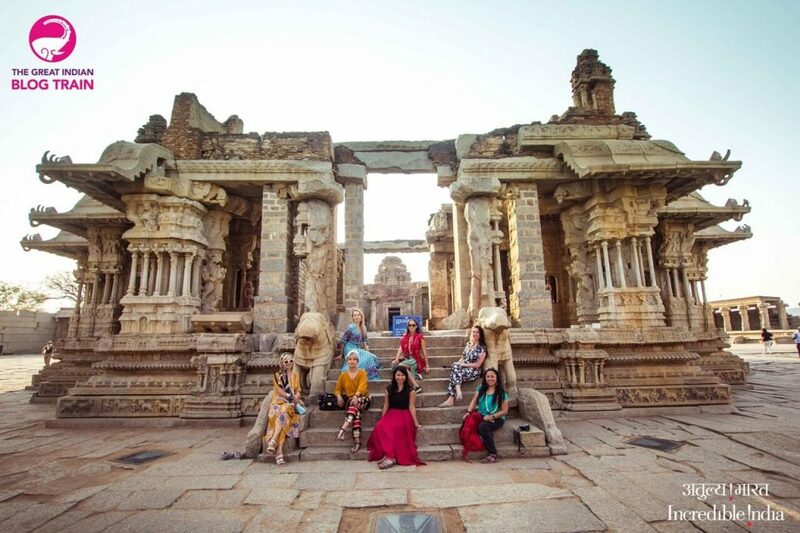 Some would leave after the trip, happy that they’ve seen some of the best parts of India — great food, friendly people, world heritage sites, and the country’s breathtaking natural beauty. Others, however, might see the trip as simply a teaser, a brief introduction that would (hopefully) start their lifelong love affair with India. This won’t be my first time in the country. I have experienced the best and the worst it can offer to solo female travelers, and I’m very much looking forward to experiencing something different this time. 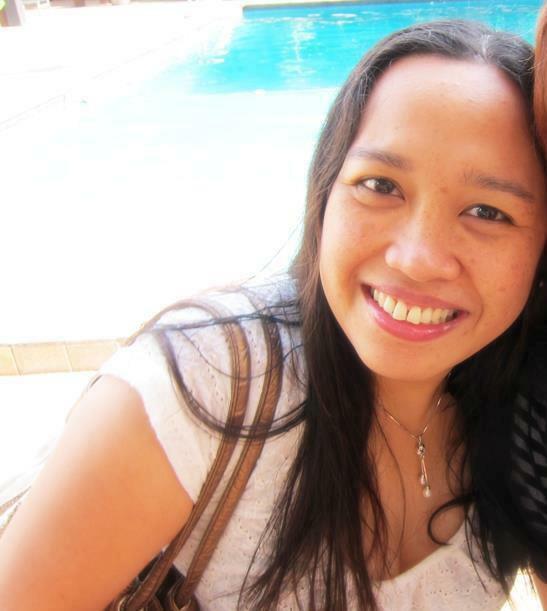 I know Mother India will welcome me and I can’t wait to see her again! Have you been to any of these places in Southern India? I like the look of that train. I’m a total train buff myself. And I have to say that I totally love traveling in India. Especially when I am cycling around the country, or taking the train. Oh my how lucky can you get! We looked into doing one of these before, but as expected, this experience was as they say “above our pay grade”. Hope you enjoy it and I cannot wait to hear all about it on the blog and IG. I;m glad you had a good experience this second time. I feel you have to give India some time and visit at least a few different places before you can make a decision about it. My first two trips to Delhi were terrible, and then I restricted myself for over 5 years. Then I visited Rajasthan and it changed my life. It was beautiful, but yes, I will never go back to Delhi again. This sounds cliche-ish but I watch a lot of Bollywood films, really enjoy them, and have always wanted to go to India (it really is a beautiful country, so many places to go to!!!) but know how dangerous it is for women. You’re very brave to head back after your experience in 2013, and hoping to read more (and hopefully all positive) experiences on your upcoming posts!